Garden Route fires: where to now? As in the rest of the world, drought, heat, freak weather and out of control wildfires are on the increase in the Garden Route, highlighted by the recent November 2018 fires, which surpassed in intensity and extent all wildfires in this region over the past 100 odd years. Not quite yet the proverbial last straw to break the camel’s back, these fires, together with the cumulative impact of fires that have occurred over the past two decades, have posed serious challenges to the capacity to protect assets in the Garden Route, including the forestry and timber industry. • the continued viability of forestry and the timber industry in the light of these conditions. This article will deal with the first point above – the challenges facing the Garden Route in regard to future prevention and fire suppression capabilities. The recent Garden Route fires cannot be assessed in isolation from what’s happening around the world. Earth warming has greatly intensified heat waves, droughts and strong winds, that have in turn triggered increasingly intense wildfires in regions with winter rainfall, hot dry summers and fire driven vegetation ecologies, like California, south-eastern Australia, Tasmania, southern France and the western Cape in South Africa. It also has been a major cause of wildfires in moist and cool forested areas in parts of Europe, Scandinavia and Siberia, which is close to the Arctic Circle, and where the vegetation normally isn’t fire prone or adapted to fires. Very recent heat waves with record high temperatures in California and Australia have caused catastrophic fires, even fire tornadoes, which not only caused loss of lives and razed towns, but have destroyed hundreds of thousands of hectares of natural and altered forest ecosystems to such an extent that some of them are deemed to be irreversibly transformed into grass and shrublands. Fire seasons have become longer. Literature on these fires contains words like megafires, unusual, unprecedented, record, new normal. In Australia extreme and catastrophic categories have been added to fire danger rating to provide for these extreme conditions. Scientists in the USA and Australia are now increasingly recognising that human caused climate change is the key driver of these catastrophic fires. In comparison with these regions, the western and southern Cape have not yet experienced quite the same extreme levels of freak weather conditions. Is this perhaps the reason why the weather conditions were downplayed in recent scientific assessments of the 2017 Knysna fires? For a long time fire experts in the USA clung to the notion that a build-up of biomass due to changes in land use and management over decades, preventing regular natural fires, combined with fire suppression, was the actual cause of the catastrophic wildfires. Whereas this is certainly valid for many areas around the globe, including the Western Cape and the Garden Route, this by itself cannot adequately explain recent fire behaviour. Closer to home experts in forest and veldfire management have been grappling with these issues and most of them find it difficult to accept the idea of changed weather conditions being the main factor behind the recent destructive wildfires. What makes it difficult to separate out the causes is the fact that fire management, prevention as well as suppression, has undergone marked changes over the past three decades – generally it has deteriorated. From discussions I had with local fire experts and foresters, viz. Piet van Zyl, Francois Sparks, Braam du Preez, Paul Buchholz and Charles Whitcher, who between them have many years of experience in hands-on prescribed burning of fire breaks and blocks, as well as fire fighting, an interesting picture has emerged. Most of them felt that, although they acknowledged the effect of a much altered climate, these wildfires could still be contained by returning to the fire prevention practices that were in place in the days of the Forestry Department, which until the 1980s controlled and managed the State plantations as well as the State mountain catchments. In those years a mosaic of different fynbos veld ages was established by controlled burning of large mountain blocks, in conjunction with invader vegetation control. A system of perimeter firebreaks of several hundred metres wide were burnt in rotation where plantations bordered natural veld, as well as hoed or ploughed belts along roads and under eucalyptus belts inside plantations. That this system was highly effective (in spite of runaway fires caused by such controlled burns now and then) in those days, is beyond question. That it could greatly assist, if accompanied by adequate numbers of experienced fire fighters and equipment, to contain some of the very intense wildfires of today, cannot be denied, as has been proven by A.C. Whitcher’s highly effective system of very wide fire breaks around their plantations in the Tsitsikamma. In both the 2017 and 2018 megafires that ravaged the MTO plantations in that area, AC Whitcher lost only about 30 ha. Due to their relatively small and fragmented plantations Charles Whitcher was able to detect and put out spot fires in individually affected plantation blocks before they spread. In the November 2018 fire he was able to conduct a risky counter-burn from these perimeter breaks, which very successfully stopped a fire front that was driven by gale force winds and saved a plantation block. However, what Charles Whitcher is able to do on a relatively small scale, is a different matter when it comes to large forestry enterprises like MTO. Since the State plantations were commercialised and later privatised into what today is known as MTO, the proverbial fat of the old days had to be shed, and eventually, as bean counters played the tune, the slogan became: mean and lean. This meant a severe reduction in manpower – machines replacing labour – which doesn’t line up with the requirements for activities like burning kilometres of breaks in fynbos, large block burns in mountain veld, and fire suppression in inaccessible terrain, which cannot be mechanised. The State in those days carried the risk, and the investment in large work teams (at low wage rates compared with today) was a kind of ‘insurance’ against damage by wildfires. This is illustrated by the following example: According to Piet van Zyl and Braam du Preez, the 1996 Bergplaas-Witfontein fire, the first of a spate of climate change induced fires, was contained by Safcol fire fighters by drawing on in-house resources from nearby Safcol plantations that were then still abundantly available. Altogether about 400 skilled men were deployed, while at the October 2018 fire, under much more extreme conditions, in the same area only about a tenth of this number could be deployed. Moreover, the adjoining State mountain catchments were transferred to conservation bodies. The consequence was that the old policy of investing in wide fire breaks burnt in rotation, changed into hoed or ploughed perimeter breaks of the bare minimum of width required to satisfy the fire insurance firms. The rationale being (quite correctly), that a fire break is not necessarily capable of stopping wildfires, but a defence line from where to counteract wildfires, inter alia by back burning. It so happened that these changed approaches conformed to the requirements of the Veld and Forest Fire Act (Act No. 101 of 1998) regarding fire prevention and readiness. Although this fitted in nicely with the bean counter approach when it came to balancing the books, it left the poor MTO managers red faced when they had to combat the recent megafires over wide fronts with reduced own labour and not nearly as effective and reliable Working on Fire (WoF) proto teams. Adding insult to injury, in the Tsitsikamma, which falls under the Sarah Baartman DM Fire Brigade (E/Cape), MTO had to abandon their plantations to the mercy of the fires in order to protect human lives and settlements in the area, because the former failed miserably in this regard. Likewise, other State organs like the provincial parks authorities and SANParks have had to contend with reduced capabilities: finance, equipment and adequate skilled labour forces – plus a drain by natural attrition of the highly experienced forestry fire managers in their ranks. This was one reason, however not necessarily the only or even most important one, why perimeter fire breaks and burn blocks in State conservation areas in the local mountains have been increasingly neglected, resulting in the accumulation of high fuel loads. The other even more important reason is dramatically increased risks and unfeasibility owing to climate change. 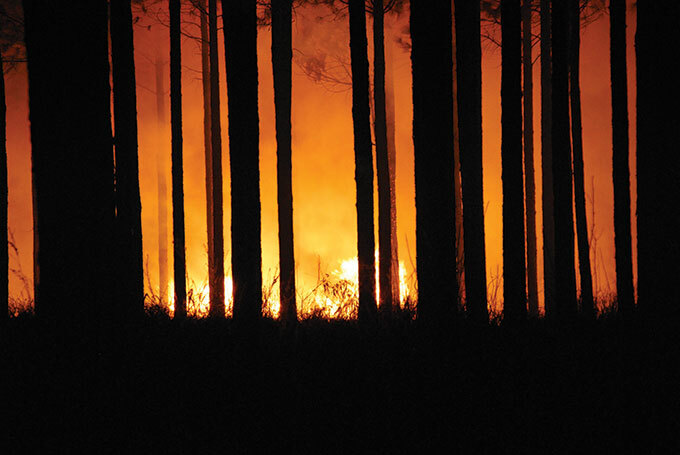 Adjacent managers shrink away from carrying out controlled burns because if these run away into plantations their institutions may be faced with huge financial claims. You cannot conduct high-risk controlled burns, including counter burns under extreme wildfire conditions, in fynbos with a high fuel load, without highly skilled and adequate numbers of experienced staff, and without the nerve and confidence that comes with years of experience. This becomes clear when listening to old hands like Piet van Zyl and Francois Sparks, who told of conducting controlled burns in mountain veld in the Cape Peninsula, Outeniquas and Tsitsikamma mountains that would be unthinkable today. Francois cited one case where a large team under his command burnt an extensive mountain block in the Outeniqua catchment behind the Karatara Plantation in the 1980s without even preparing tracer belts in the notoriously tall dense fynbos, just by lighting and extinguishing the freshly lit flames as they went along. The climate of those years and the skills of the forestry workers made this possible. In those days the southern slopes of the Outeniquas were so damp even at midday that one could only light a controlled burn with great difficulty. Wide swathes of vegetation were often slashed beforehand so that a fire could get underway in the dried slash. Francois said that under current conditions such operations would be an impossible risk as the weather is much more erratic, with few burn opportunities. This is compounded by the reduced capacity of the institutions for managing the land under their control by fire. This is corroborated by research carried out in Tasmania, a state plagued with mega runaway fires, which found that it is in practice only feasible to burn certain selected strategically located areas to reduce fuel. All these realities have left no other option but to pool resources and share fire management, and especially fire suppression, among all the role players through the incident command system. Modern technology can play a key role. This is also where the specialised dedicated teams from WoF come into the picture. They are, however, a poverty alleviation project funded by the Extended Public Works Programme, which is also their weakness, as they cannot be totally relied upon during critical fire fighting operations. In the October 2018 fires there were instances where teams deserted their stations at the end of the working day while fires were still raging. This is something that requires serious attention. In my discussions with the foresters there was general agreement on one aspect: we cannot just do nothing, we must attempt to reduce fuel loads wherever possible. It doesn’t require rocket science to conclude that the feasibility of doing this in fynbos mountain veld is not only determined by climate and changed capabilities, but also by available funds and logistics. 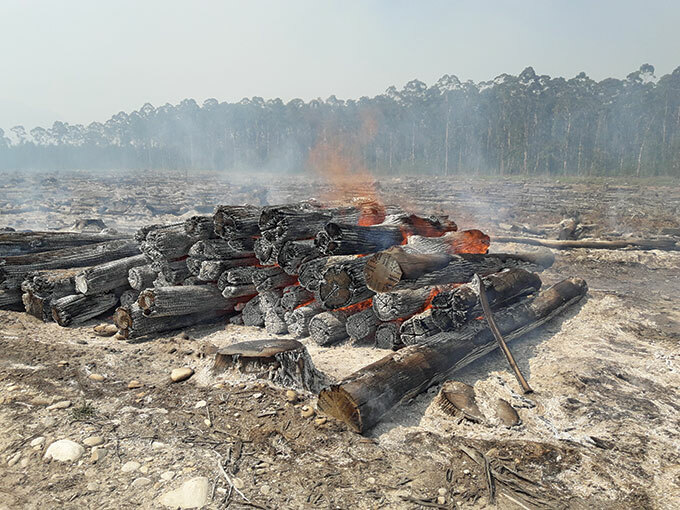 In the Tsitsikamma the feeling among foresters seems to be that controlled, under canopy burning in plantations, although desirable from a fuel reduction aspect, is too risky under current climatic conditions. Instead, Charles Whitcher for instance keeps his plantations almost clinically clean from any undergrowth, preventing surface fires from spreading up into the crowns. 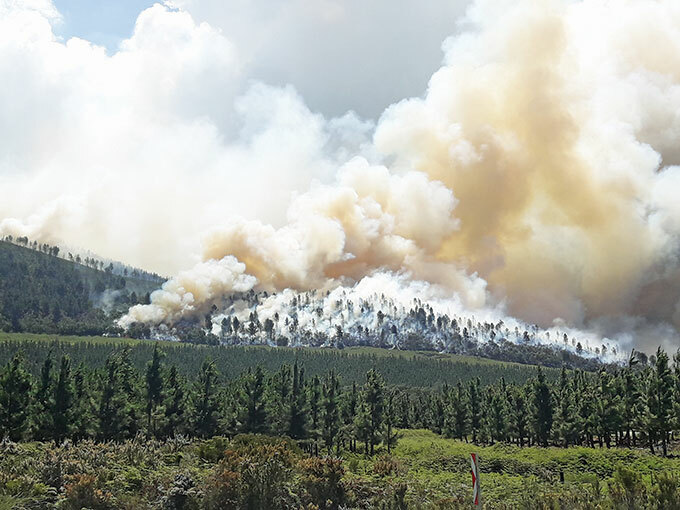 Braam du Preez, Paul Buchholz and others mentioned the desirability of executing controlled burns in the rest of the fynbos areas that escaped the 2018 fire, because this could be done with limited risks now that most of the mountains have been burned clean. Additionally certain strategic veld blocks should be burned periodically for fuel reduction purposes. Paul informed me of an initiative to develop an integrated fire and invasive alien plant control strategy for the Garden Route District, under the auspices of the Garden Route District Municipality (GRDM). A small technical working committee to coordinate and prioritise projects will be formed under the Garden Route Environmental Forum facilitated by the GRDM. Through this initiative it is hoped that all stakeholders will join forces to implement integrated fire management and invasive alien plant control projects in the Garden Route District to improve water security, reduce the risk of catastrophic vegetation fires and conserve biodiversity.